The global brand-name that is 'Harley-Davidson' started in a small shed in Milwaukee! After a few faltering steps, the fledgling firm found its feet, in 1913. The first bikes 'out of the shed' had a single-cylinder engine. 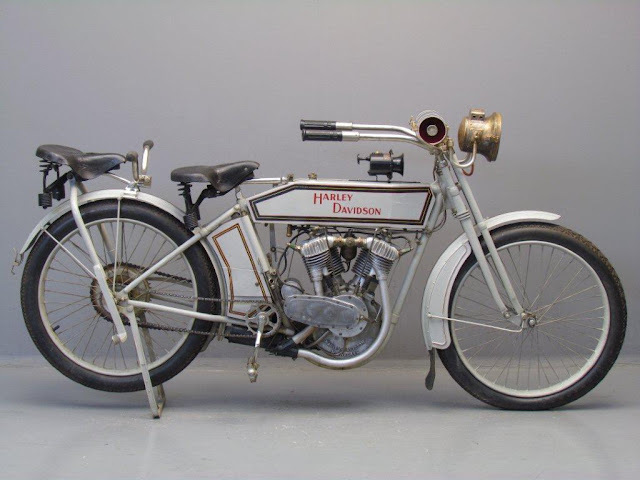 The Model 9E, though, came complete with the 45° V-twin, which was to make Harley-Davidson famous. The 1,000cc motor kicked out 10bhp - and delivered a top speed of 60mph. There will be wags who will claim that nothing much has changed! Harley-Davidson has never really been considered 'cutting edge', when it comes to racing. Since its legacy is a long list of laid-back cruisers, that is not too surprising. Drag-strips are more their domain - where their torquey power-plants can be given free rein. They have long competed at circuits, too, though. The first factory team was formed in 1914. Dubbed the 'Wrecking Crew', it battled it out with the likes of Indian, Merkel and Exelsior. Such exploits - showcasing their eight-valve V-twins - garnered Harley valuable publicity. By 1919, Harley production numbers had risen to over 22,000 bikes, and 16,000 sidecars. Henry Ford, however, proved to be something of a thorn in their side. His more than affordable 'Model T' put paid to most of the American motorcycle manufacturers. Harley sales halved! Milwaukee's finest, though, survived Ford's four-wheeled onslaught. It was fortitude to which millions of bikers would be subsequently indebted. For, while the marque has certainly had its detractors, it was Harley-Davidson which truly put motorcycling on the map. For once, the word 'iconic' absolutely applies. The Model 9E was where it all began!